The ultimate combination blade is now available in a thin kerf design with Freud's LU83R. The groups of five teeth include one flat tooth for ripping, followed by four alternate top bevel teeth for crosscutting and a large gullet for effective chip clearance. This blade also features laser cut anti-vibration slots, practically eliminating the vibration that resonates in standard blades. With this combination blade, there is no need for stabilizers. Freud LU83R010 Thin Kerf Combination Saw Blade--10-inch diameter, 5/8-inch arbor, 50-tooth COMBO design. Perma-Shield Non-Stick Coating reduces blade drag, protects the blade from corrosion and pitch build-up. MIBRO's 8" Stacking Dado cuts clean edges, square shoulders and flat bottoms. Use the Dado to cut smooth and precise flat-bottomed grooves, either across or with the grain in all types of wood, plywood and composite wood materials. It's ideal for the DIY, home or woodworking enthusiast, and light professional user. Cut grooves ranging in width from 1/4" to 13/16", increasing in 1/16"" increments. Can make a variety of different cuts, including Dado, Groove, Rabbet, Fillet, and Mortise & Tenon. Blade Technology For both the outside blades and the chippers, each tooth is electronically welded onto the blade body by fully-automated equipment from Germany. This ensures exact, centered placement and the correct amount of brazing material. Extra large carbide teeth make for longer lasting blades and overall life. Premium carbide helps to ensure the carbide does not chip or fracture easily. 8" Outside Cutting Blades The two outside cutting blades have an 8" diameter with 24 carbide teeth. Both blades have a tooth pattern of 5 beveled cutting teeth, followed by 1 straight raker tooth. The anti-kickback tooth profile prevents the blade from being fed material too quickly. 5 Chipper Blades Set includes one (1) 1/16" Chipper and four (4) 1/8" Chippers. Each Chipper Blade features two extra-large carbide teeth, which are also electronically welded onto the blade body by fully-automated equipment from Germany. The Chipper Blades are ground on the same equipment, at the same time, as the Outside Blades. 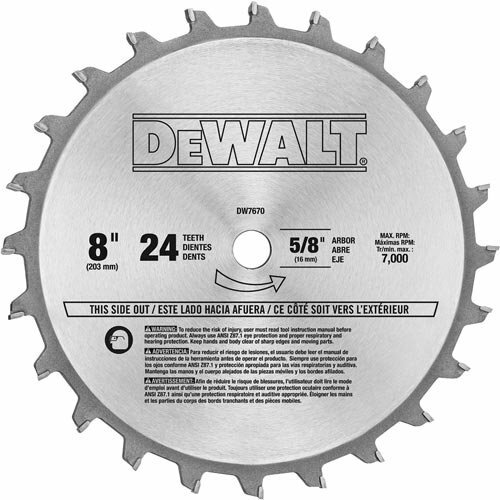 This ensures that all of the blades together will cut a flat-bottomed groove. 7 Metal Shims Use the seven included metal shims for fine adjustments to the overall width of the Dado setup. Shim widths range from 0.004" to 0.096". All of the shims have a 3-5/32" diameter and 5/8" arbor hole. 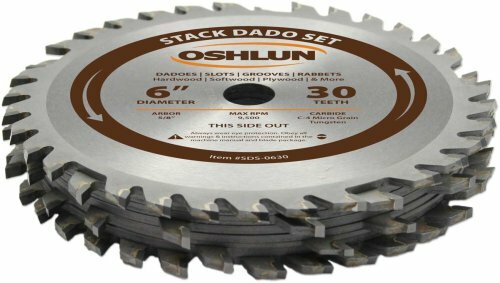 Our 16 piece stack dado sets are perfect for woodworkers who want a premium cut at an affordable price. The high tooth count saws and chippers produce smooth bottom dado cuts ranging from 1/4-Inch to 29/32-Inch. The precision ground C-4 micro grain tungsten carbide tips stay sharp longer and cut through all types of hardwood, softwood and plywood with the greatest of ease. Full body chippers make for an easier setup and less vibration when compared to other sets that feature wing style chippers. Each set also includes detailed setup instructions, a shim set for fine adjustments and a full color storage case. NOTE: Designed to cut undersized to accommodate nominal thickness-inch plywood. The 3/32-inch Chipper and Shim Set are supplied to provide Maximum adjustability. Produces small score marks on the outer edges to help eliminate tear out and splintering. Warranty: Oshlun guarantees all of our products against defects in material and workmanship for the life of the product. This does not include normal wear and tear or improper usage. This blade's specially designed triple chip tooth design produces extremely smooth, true surfaces for gluing and finish work. There is no need for sanding or jointing after the cut. The ideal working range is from 1/8" to 1" thick. This blade also features laser cut anti-vibration slots, practically eliminating the vibration that resonates in standard blades. With this ultimate ripping blade, there is no need for stabilizers. 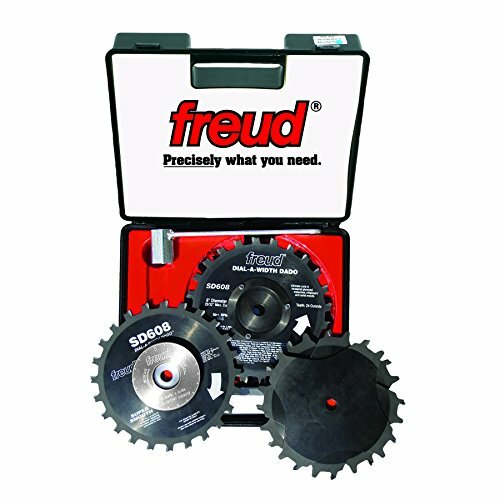 Freud engineers have discovered the ultimate combination of fused tooth grind geometry, blade body rigidity, precise tensioning, a special carbide blend and superior carbide brazing, non-stick Perma-SHIELD coating and high performance anti-vibration -- all working together in concert to provide the ultimate cut. One blade does it all. Whether you're ripping or crosscutting, a Premier Fusion blade will tackle any project. 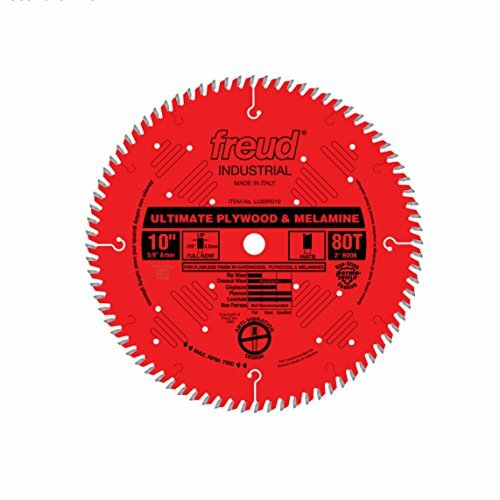 Freud P410 Premier Fusion Saw Blade--10-inch diameter, 5/8-inch arbor, 40-tooth design. The Fusion Trio includes a 30 Hi-ATB for slicing through plywood and melamine, a double side grind design for delivering polished cross cuts, and an Axial Shear Face Grind that zips through wood and sheet goods with minimal resistance. TiCo Hi-Density carbide provides a sharper edge and flawless finish with a dramatically longer cutting life. This blade s specially designed triple chip tooth design produces extremely smooth, true surfaces for gluing and finish work. There is no need for sanding or jointing after the cut. The ideal working range is from 1/8" to 1" thick. This blade also features laser cut anti-vibration slots, practically eliminating the vibration that resonates in standard blades. With this ultimate ripping blade, there is no need for stabilizers. 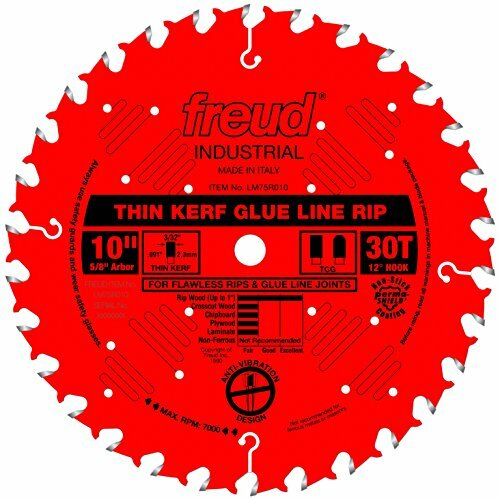 Freud LM74R010 Glue Line Rip Saw Blade with Perma-SHIELD--10-inch diameter, 5/8-inch arbor, 30-tooth design. The LU80 saw blade provides flawless, chip free edges in veneered plywoods, fine moldings, melamine, laminates, and crosscuts in solid woods. 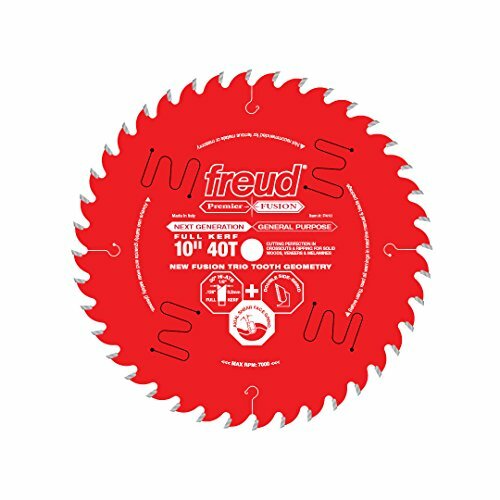 Using advanced techonology, Freud developed this line of saw blades that features laser-cut, anti-vibration slots that practically eliminate the vibrations that resonate in standard blades. The combination of High ATB tooth design and anti-vibration slots makes these blades the ultimate finish blades. The result is a cut so smooth it eliminates the need for stabilizer or a scoring blade! The 10-inch Freud LU80R010 Ultimate Plywood and Melamine Cutting Saw Blade is a heavy-duty blade that delivers a precise, chip-free finish when cutting through everything from veneered plywood to melamine countertops and hardwood molding. Featuring 80 teeth with TiCo high-density carbide tips and Freud's Perma-SHIELD coating, which helps reduce heat buildup and friction, this durable blade is built to stay true, delivering accurate cuts over the long haul. Set includes 2 outside blades, 5 chippers, wrench and carrying case. 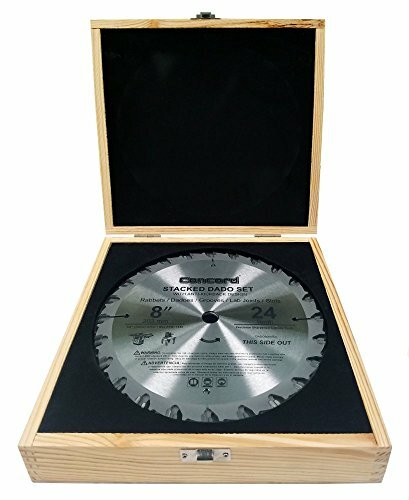 Freud SD608 Eight-Inch Dial-a-Width Stacked Dado Set, including two eight-inch blades (with 5/8-inch dadoes), one wrench, four 1/8-inch chippers, and one 3/32-inch chipper. Storage case included. Our 2 piece Box and Finger Joint Set is perfect for woodworker s who want to make precision box joints at an affordable price. The high tooth count saws produce smooth, square notches and fingers in the two most popular sizes, 1/4-Inch and 3/8-Inch. The precision ground C-4 micro grain tungsten carbide tips stay sharp longer and cut through all types of hardwood and softwood with the greatest of ease. Each set also includes detailed setup instructions and is packaged in a full color storage case. Cuts perfectly square fingers and flat bottom notches every time. Easily change from a 1/4-Inch to a 3/8-Inch cut by reversing the inner and outer blades. 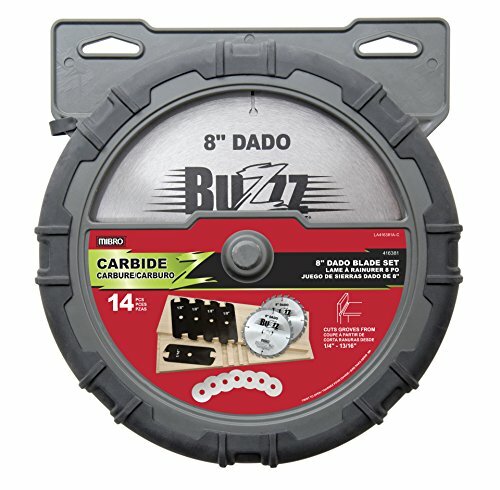 8-Inch 24 teeth dado blade set contains: (1) left outside edge carbide tip saw blade (1) right outside edge carbide tip saw blade (4) 1/8" twin tooth choppers (1) 1/16" twin tooth chopper (7) shims. Heavy-duty wood storage box. 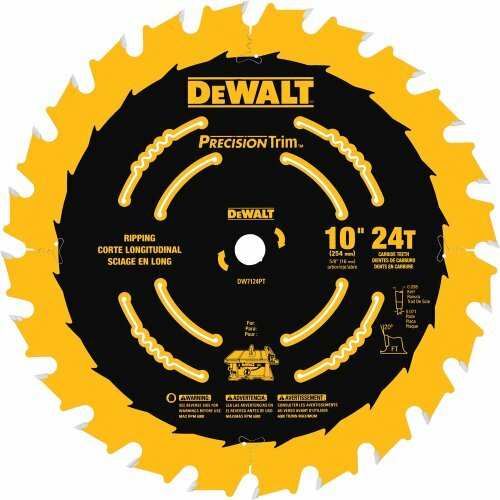 Cuts smooth dados (grooves) from 1/4" to 7/8"
The DEWALT DW3106P5D0I Series 20 10-Inch 60T Fine Finish Saw Blade (2pk) is ideal for all cutting applications in softwood, hardwood, chip board or plywood using a table saw or miter saw. 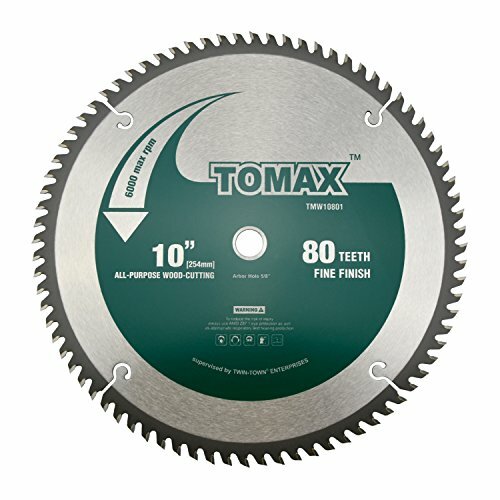 Professional quality thin kerf carbide saw blades produce a smooth finish with minimal material waste. TOMAX is a fully integrated enterprise, incorporating technology, research and development, manufacturing and marketing functions. We have over 10 years production experience in circular saw blades, abrasives and diamond tools. * 10" Diameter blade with 100 teeth. Fits most saws. Hole diameter is 1". 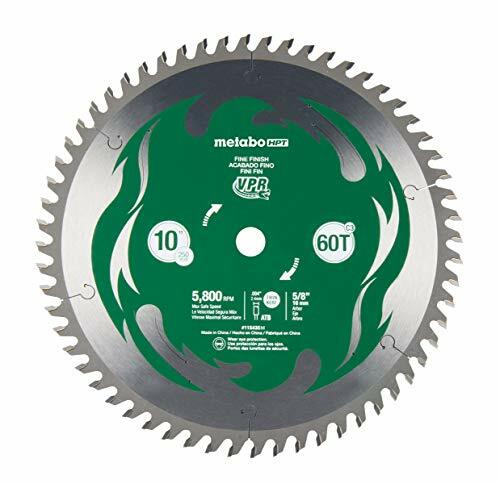 With the washer insert it is 5/8"
Metabo HPT premium vpr blades are laser-cut from high quality Japanese steel to maintain durability and cutting precision. 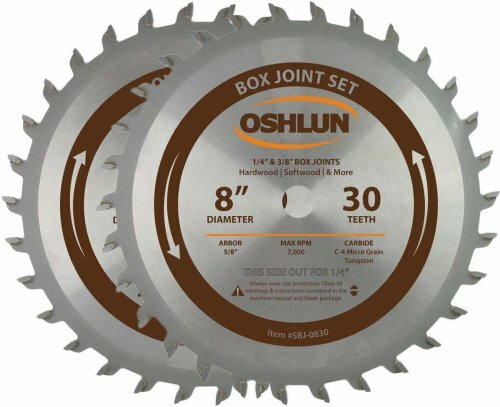 These superior blades are ideal for dry wood applications such as ripping, cross cuts, and miter cuts. Tungsten carbide tips are carefully welded to each blade tooth using computerized technology to control the exactness of the saw blades. An automated grinding process yields accurate tip geometry to increase the life and performance of the ATB C3 carbide teeth. This premium line of vpr blades is perfect for all cutting needs from framing and ripping to fine finish woodworking. Features include: industrial high performance Micro grain tungsten carbide - Micro grain structure provides extreme durability and longevity. Tri-metal shock resistant brazing - brazing the carbide tips allows the tips to withstand extreme impact for maximum durability. Large micro grain carbide teeth: allows professional resharpening and prolongs blade life. Laser-cut expansion slots - reduce vibration and noise keeping the blade running cooler. Electrophoresis coating - protects against rust. This blade gives smooth, fast rips in hardwoods and softwoods. The combination of a rigid blade body and razor sharp flat top carbide teeth will provide a "glue line" precision cut. These blades are precision balanced and can be used in gang-rip operations. The ideal working range is from 3/4" to 2-3/4" thick. This blade also features laser cut anti-vibration slots, practically eliminating the vibration that resonates in standard blades. With this ultimate ripping blade, there is no need for stabilizers. 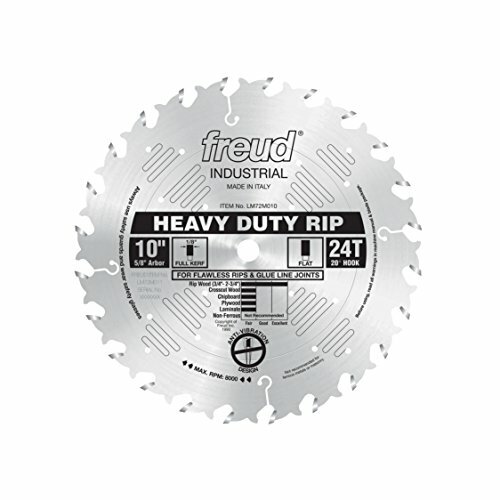 Freud LM72M010 Heavy-Duty Rip Saw Blade--10-inch diameter, 5/8-inch arbor, 24-tooth design. This industrial blade cuts acrylics, polycarbonates and other plastics, leaving a smooth finish without melting. By combining micrograin carbide tips with a specially modified triple chip grind these blades will give a clean smooth cut. These blades produce less heat keeping the cut edge crisp. 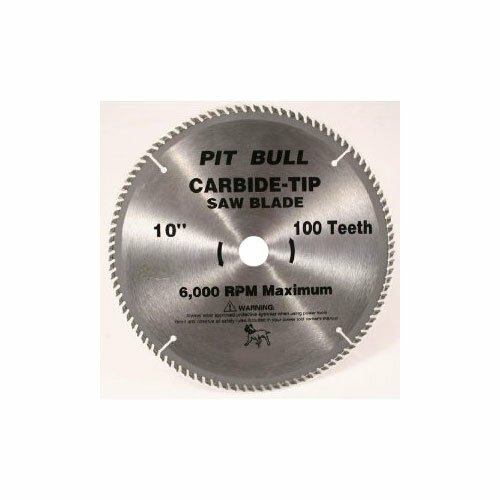 8" Blade Diameter, 5/8" Arbor, 64 MTCG Teeth, MTCG Grind, .110" Kerf (K), -3 Hook Angle, .087" Plate (P) Ideal For: Plexiglass and Plastics. Depth of cut (1/4" to 1-5/8"). Application: Specialty Blade. Made In Italy. 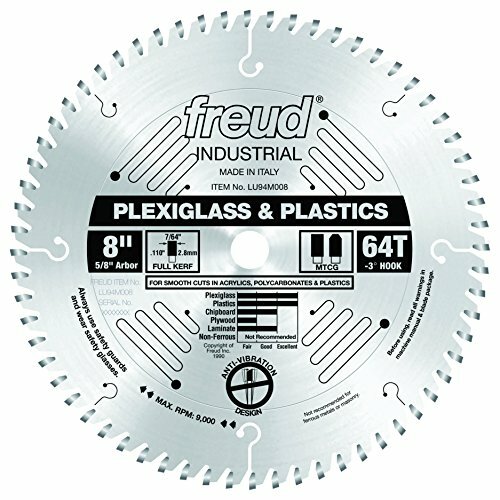 Freud LU94M008 Plexiglass and Plastic Cutting Saw Blade--8-inch diameter, 5/8-inch arbor, 64-tooth design. This superior blade gives glass-smooth finishes when crosscutting hard and soft woods, so no sanding is required. What makes this blade so special is the unique side grinding of each tooth. The teeth actually polish the material as it cuts. New laser-cut anti-vibration slots practically eliminate the vibration that resonates in standard blades, producing glass-smooth finishes. With a finish this perfect you won t need stabilizers! 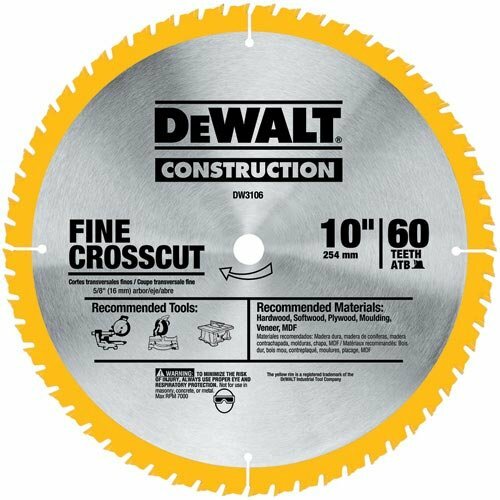 8" Blade Diameter, 5/8" Arbor, 64 ATB Teeth, ATB Grind, .116" Kerf (K), 10 Hook Angle, .098" Plate (P) Ideal For: Ultimate crosscutting blades for glass-smooth finishes when crosscutting hard and soft woods, so no sanding is required. Depth of cut (1/4" min to 1-5/8" max). Application: Crosscutting. Made In Italy. Freud LU85R008 Ultimate Cut-Off Saw Blade with Perma-SHIELD--8-inch diameter, 5/8-inch arbor, 64-tooth design. This elegant flat card makes the ideal invitation to just about any event! This grape-colored card features a floral spray jutting out from the bottom left side of the card. Add your personalized text to complete the look. 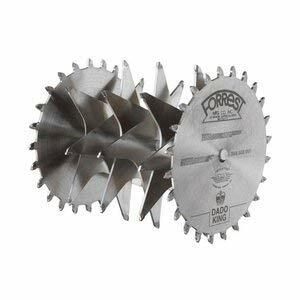 Warranty: Purchase any Forrest blade or dado and use it for up to 30 days. If you are not completely satisfied for any reason, return it for a full refund.